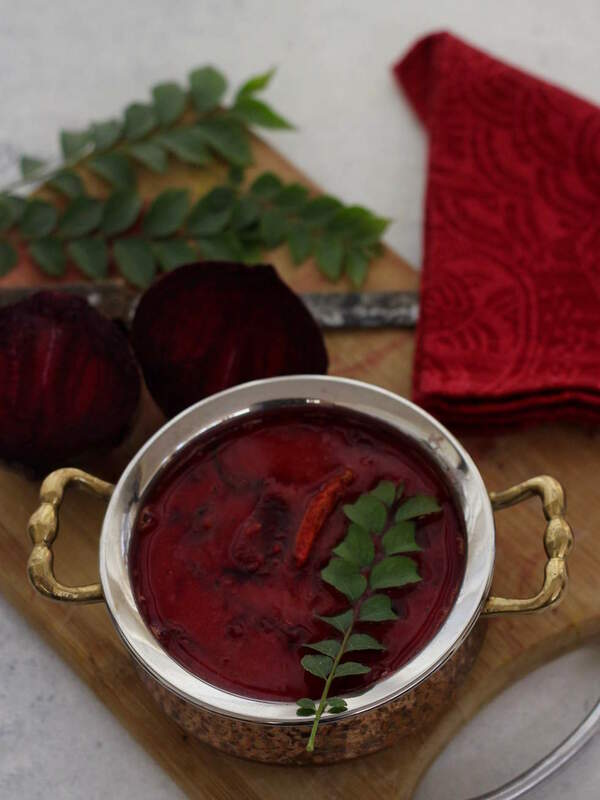 Recipe for beetroot sambar – a South Indian dish prepared using yellow lentils and beets, to be had with plain steamed rice or any other cooked grains like millet or quinoa. Sambar is the staple food in any Tamilian household. [read: how to make the perfect sambar] It’s a balance of protein from lentils, vitamins from the vegetables, calcium and potassium from tamarind. It is usually served with rice and a dry vegetable curry. Vegetables that can be used in a Sambar are Madras onions, carrots, Bhindi / okra, Pumpkin, Radish, Sweet Potato, Drumstick etc. But that doesn’t restrict you from using any vegetable that you have on hand, or even any green leafy vegetables that are in season. As a kid, I would love messing my hands with the peel when my grandmom used to be busy chopping beets up for beetroot sambar. I would also love the natural red blush-on effect when the peel was rubbed on the cheeks. I can call myself a visionary for discovering organic make up even before the world had thought of it. LOL, right? I’m not too fond of the sweet, almost metallic taste in the beetroots. There are only two ways I can eat this vegetable. One is to grate some parts of it into a spicy curry, to which it imparts a brilliant colour, like this healthy pav bhaji. The other is in a beetroot sambar, like this one. The flavours from the tamarind and sambar powder pretty much mask the weirdly sweet flavour of beets. You can easily prepare the beetroot sambar or beet and lentil stew in an Instant Pot, because diced beets and yellow lentils have a similar cooking time of around 8-10 minutes in full pressure. In my method, I use the tiered vessels in a regular pressure cooker. Lentils (tur dal) is in one compartment and quartered beets in the other. Peel and dice the cooked beets and add to the cooked lentils, along with tamarind puree and sambar powder to prepare this beetroot sambar. 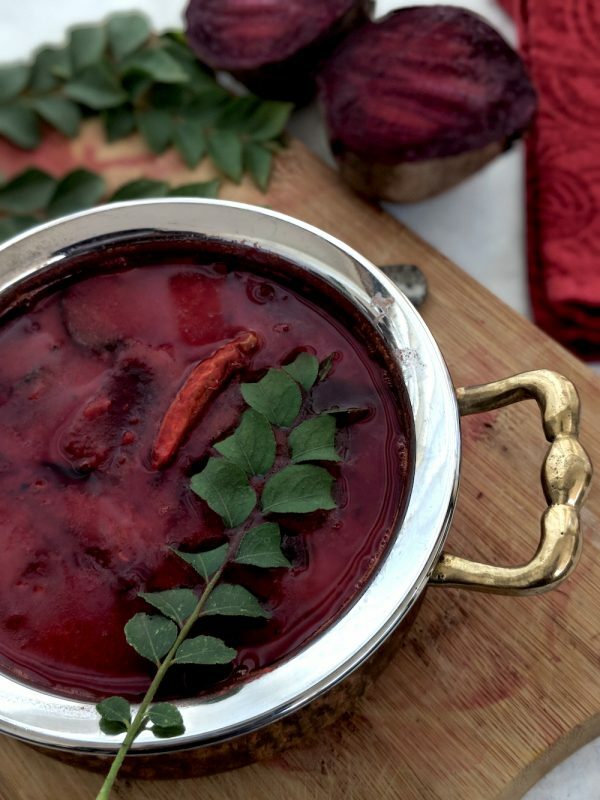 Recipe for beetroot sambar - a South Indian curry with yellow lentils and beets, best served with plain steamed rice and a dollop of ghee. To prepare beetroot sambar, we need to first cook the beets and lentils. Pressure cook the dal with a pinch of turmeric. If you don't have a pressure cooker, then soak dal for 30 minutes and boil with 3 cups of water for 30-40 minutes until mushy. Pressure cook the beetroot. If you are using a pressure cooker, use the separators and cook dal in one compartment and beets in the other to save time. Cooking time is similar for both tur dal and beetroot. Tug off the skins from the cooked beetroot and cut into thick slices and dice. Heat the oil in a pot. Add the mustard seeds, fenugreek seeds and curry leaves. Once the mustard seeds pop, add a pinch of asafoetida and give it a quick stir. Add the cooked chopped beets, stir for around for 2 minutes. Add the tamarind extract to this and bring to a simmer. Slake the sambar powder in 1/4 cup water and add it to the pot. Bring to a simmer. Put the cooked dal, salt and boil for 2 minutes. 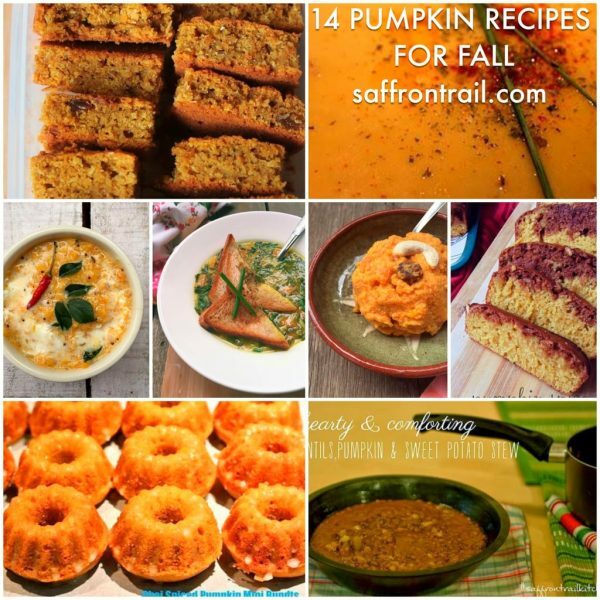 The same sambar recipe can be prepared using radish, carrot, turnip or sweet potato. In case of carrot or sweet potato, the vegetable can be sliced and added raw, allowing it to cook by simmering in tamarind water. 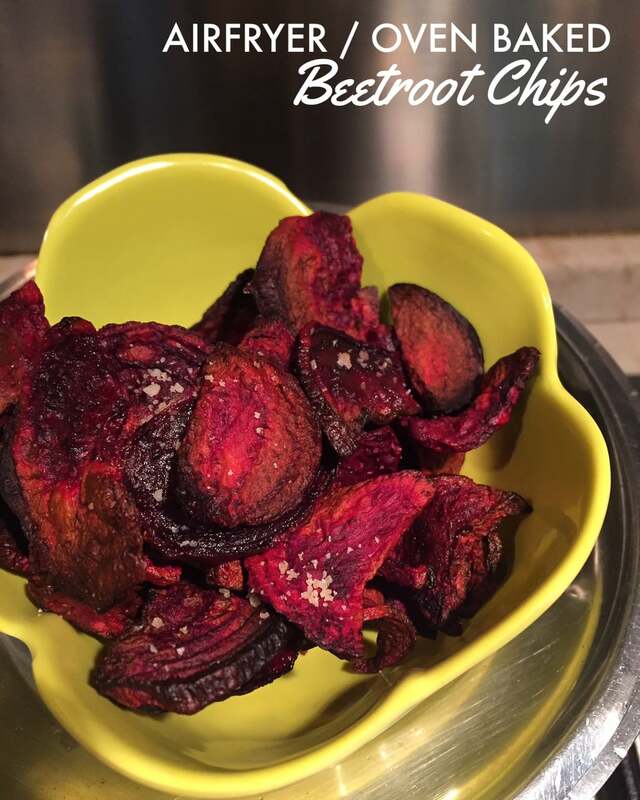 Beetroot takes a long time to cook, hence better to use pre-cooked beets. Check this recipe for a delicious Beetroot Halwa that is my aunt's specialty! Originally published on May 20, 2006. Updated with new photos and text. I love learning about new dishes like this and Sambhar is something I didn’t know about. I’m guessing I would like this a lot because I love the taste of tamarind. Nandita,Beetroot in Sambar? Never ever heard of it. All the more reason for me to try it out. 🙂 I anyway like experimenting with beetroot. I have bookmarked this one for me now. Hey Kalyn- I’m sure you will love this, the tartness of tamarind is perfectly complimented by the sweetness of the beets-adding lentils just makes it so much wholesomeSN & Vaishali- Let me know how you found it !! Love beetroot sambhar, my all time favorite! Goes well with rice and podi :)Which cook books are those in the pictures? Is sambhar same as parappu? If not, how do they differ? The cookbooks are ‘samaithu paar’ by meenakshi ammal- which is translated in english to Cook and See. The recipe is not from that book though, but kept it around as those books teach authentic tamil cuisineSambhar HAS paruppu in it- but is not the same as paruppu, paruppu means just dal and sambhar has many more ingredients in it than just dal! Beet sambar!! Never tried this before.I have some bottled beets in vinegar in my fridge.May be it will work.I will let you know. Hi folks! Vengalam is bronze (Sanskrit/Tamil), and utensils made of bronze are awesome if you want the heat to spread uniformly. Due to heavy construction (it is difficult to make into thin shapes) it has a high thermal mass. 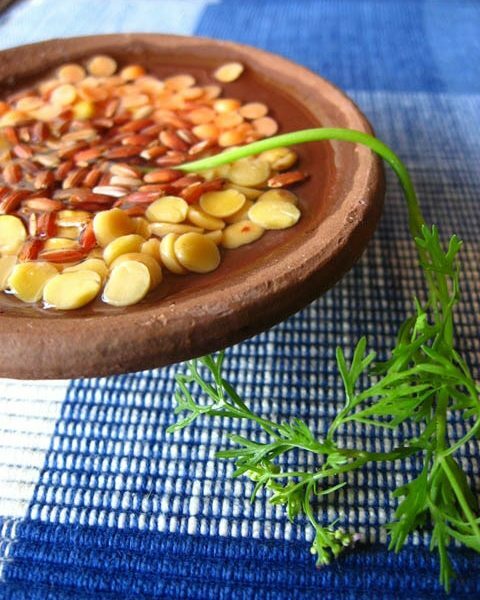 Hi Nandita: What is the cup quantity of Toor Dal that features in your list of ingredients? Instead of a number I am seeing “xbe?” — Thanks, Dido. that’s a silly error that’s happened when I migrated to wordpress. let me check this – sorry about the late response.